[By Paulo Mendes in Vila do Conde, Portugal ] The project “(a)Riscar o Património” (Sketching the Heritage) is a partnership between Urban Sketchers Portugal and DGPC, the Portuguese Bureau of Cultural Heritage. 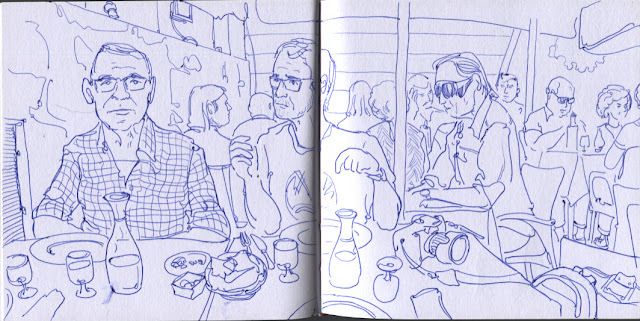 Every year by early Autumn, a sketching event takes place in several places across the country. The 2018 edition happened last Saturday 29th September on 15 locations from north to south plus islands. Vila do Conde was one of them, and it was my personal choice. Vila do Conde is a lovely and monumental coastal town at the mouth of the Ave river, some 20km north of Porto and easily reachable by metro. 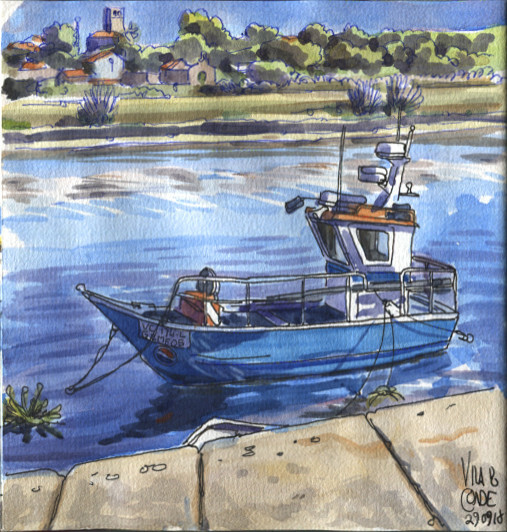 It has no lack of sketchable subjects, and the program for this year was to sketch the riverside area from the main bridge to the fishing harbor. I started with the view at the top of this post, an attempt to capture the river but also the local architecture with the replica of a 16th century ship in between, and the unmistakable whitewashed little dome of the Socorro chapel. 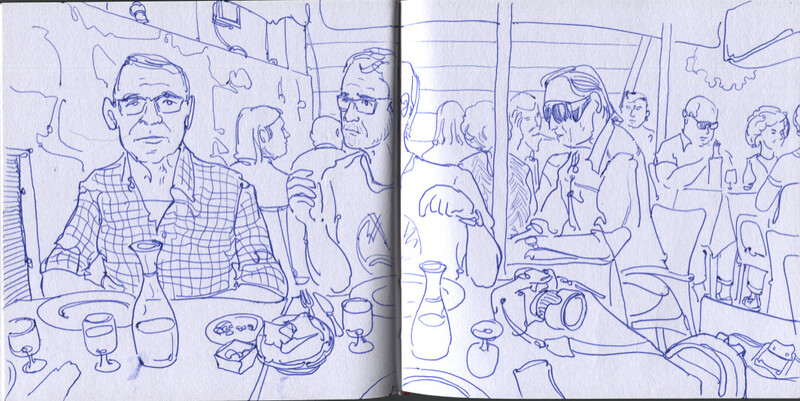 Four of us joined for lunch in a nearby nice fish restaurant, including our warm welcoming host João (at right on our table). 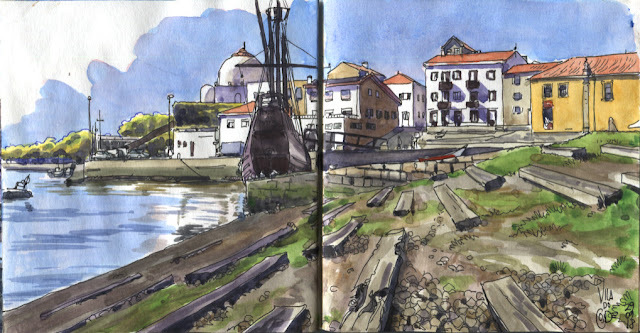 After lunch, my intention was to go back Porto to join the local activity meanwhile started, organized by Urban Sketchers Portugal Norte. But how to resist Vila do Conde's quiet atmosphere in such a warm sunny day? I ended up letting myself stay, while sketching one of the many little fishing boats at the harbor. The next day in Porto, I decided to join my sketcher friend Rui, who intended to follow the program that was proposed for the activity we both missed: A traject from Carlos Alberto square to Ribeira, capturing five of the city's most iconic statues on the way. I could manage to squeeze all of them in a double page... And this was the end of a great sketching weekend!